bible verse | My Life with Christ. Brothers and sisters, whatever is true, whatever is noble, whatever is right, whatever is pure, whatever is lovely, whatever is admirable–if anything is excellent or praiseworthy–think about such things. Its good to be aware of the negative things around us, but it is so much better to witness, learn, and understand God’s great plan for you than to find ways to bring the enemy down by your own strength. Stop trying too hard and LET GOD LEAD, because it is ONLY BY HIS GRACE that we are able to receive our salvation. Not by works, not by your own faith, but by God’s grace THROUGH the FAITH that He has given you. Things might not be going so well for you, but I hope and pray that you will learn to look past that and continue to glorify God in the midst of your difficulties because it is written in Matthew 6:4 that when you DO GOOD, do it IN SECRET. Then your Father (God) who sees what is done in secret will reward you in full. Hello my lovelies, I know I haven’t been writing much, as always. There were so many things I had to deal with (both good and bad) that I didn’t find the right time to write. Well, that is both true and false (laziness). Anyway, part of the reason is that I’m at the Philippines! Aaand, I’m going back to Dubai once again. So fast right? *sniffles* I’m feeling mixed emotions right now. But good news! I have so much to write about! I just hope that I find the time to write it, hehehe 🙂 Man, God has been so good… but I couldn’t list them all right now or even then because there’s just too much to list. Anyway, I got to go spend as much time with my family and relatives (by watching a nice movie together) before we leave. I pray that you all be blessed by this post and that whatever you are going through right now, know that God will never leave you! He will be there for you through it all ❤ God bless my lovelies! School’s ended a bit too early for me, though I must admit I had prayed so much for it to end, yet I still feel a deep void within me. My situation? I’ve lost my passion. I haven’t really lost it, I just feel like I did. Of all the things I’ve gone through, I find this the hardest to deal with. I find it impossible to not hunger for the Lord. He has done so many wonders in my life, He gave me so many beautiful things I don’t deserve, showed me a glimpse of Heaven through His creations, and because of that one touch of His love, He changed me… But my desire for God is like a roller coaster, it just goes up and down, but never stays up where all the beauty could be seen and admired. I expected to have an exciting vacation filled with missions and glorifying praise for the Lord! But it was when vacation started had I felt the loss of purpose and growth of boredom. How do I turn this Holiday, into a Holy day? We should pray even if we don’t feel like it. PUSH! Pray Until Something Happens. It was a simple command to pray, but ignoring your emotions isn’t. I can’t count how many times I had dismissed my prayer time for my own desires or just plain laziness, but has God ever dismissed my requests? No, He listens and he answers. I know this, because I have witnessed it. Then why at times do I feel like He’s not there, when I know for sure He is? Here’s a thing we should all remember, our feelings our unreliable. Our feelings change all the time, we can’t rely on it. But our God and His word? it will never change. Our identity is based on the bible, God’s word, and not our emotions. Makes sense? (Luke 22:33-34) But he said to Him, “Lord, with You I am ready to go both to prison and to death!” Jesus answered, “I tell you, Peter, before the rooster crows today, you will deny three times that you know me.” and yet again, He was right! Amazing isn’t it? But why would God allow this? What’s the purpose of trying to connect with God when He simply allows me to feel like He’s not even there? What’s faith when we could FEEL God all the time? And that basically answered it, God answered my question with another question haha. Man, there are lots of proof that God exists, yet why do I still doubt? Well, its human nature. But we have a perfect God who will never leave us, who will never give us up. He loves us. And I keep saying this because I KNOW it, I have felt it, the feelings just kind of vanished though- but I’ll keep fighting for that, you know why? Because once you have felt that LOVE of GOD… you will never be the same again. You will yearn for it. How do I fight the wall that’s keeping me from God? So I tell you now (including myself), be persistent. No it doesn’t annoy God as I thought it would, instead, it grabs His attention and He sees what’s in your house- sorry, I mean heart. Haha, I wandered off a bit over there. Anyway, see my point? I know its easy to just stay where you are and stay depressed and discouraged and just wallow in it (because after all these times you’ve carried this for so long, and now its turned into your comfort zone- and no matter how ironic this is, its true) but I tell you now, that unless you do something about it, surrender, and be right with God you will never be able to fill up that missing piece in your heart. That desire to be used… it always stuck. I always wanted something big to happen, for God to surprise me. But its been so long and nothing happened. I became discouraged and lost hope. But you see, I should be in content with what God has given me. If I ain’t content with the small things in life, then what about the bigger things God has in store for me? Do everything, and I mean everything you can to feel and ignite that connection between you and God. Fight for it! If its singing, reading the bible, praying- just do whatever it takes. Even if it only lasts for a moment. I just couldn’t get over it. You could never get an overdose from the love of Christ. Never. This is a pretty long post- or at least for me… haha! but I just really felt this one in my heart. And I really want to encourage all of you to, NOT give up on the Lord 🙂 He never gave up on you. That’s all for now lovelies ❤ God bless you all! Here’s a verse for you and a word of encouragement! Amen! You might be planning ahead for something right now, it may be your college course, it may be your job, your new house, your school, relationships… but don’t worry- if it is the Lord’s will, who could go against you? Just have faith, do the next right thing, and God will direct your path. Don’t be afraid, God, king of all kings, is with you! If You Had to Choose… Family or GOD? Many people believe in Jesus, even satan himself believes in Jesus. It’s safe to say that some people may believe in the Lord but not all will inherit the kingdom of Heaven (Matthew 7:21). Let me ask you one important question, why do you believe in Jesus? What made you believe in Him in the first place? Now the whole topic here is “Jesus or Family”. Many people believe in Jesus because they want to be together with their family in Heaven. This is true, and trust me this will happen. It’s part of God’s plan. But when you ask them, “who would you choose, Jesus or your family?” Who would you think they’d choose? Who would you choose? Well, think about this, what if your wife leaves you? or what if your child dies one day? What if, everybody turned their back on you, even your loved ones? then what? Who would you turn to then? Remember that God is a Jealous God filled with love-driven jealousy. He knows you love your family dearly (and so does He)… but the Lord also knows if they’re preventing you from finding the real reason why Jesus, His son, died on the cross for our sins. Maybe the only way for you to really move on, is for God to take someone away from your life and bring in someone new. The God who opens doors also closes them, but trust me when I say, He has a very good reason to. He has a plan. Something far GREATER will come your way. Just trust in Him. Also remember that your wife, your husband, your children, your siblings, your grandparents, and loved ones here on earth AREN’T GOD. They do not hold the key to Heaven. Jesus does. Your family NEEDS SALVATION just as much as you do. Remember that Jesus is the bread of life (John 6:35). We have to eat His bread and drink His blood BY FAITH (not literally eat Jesus) and eating is a personal thing, right? You can’t let somebody else eat your food and have YOU benefit from it! Salvation is a personal thing. 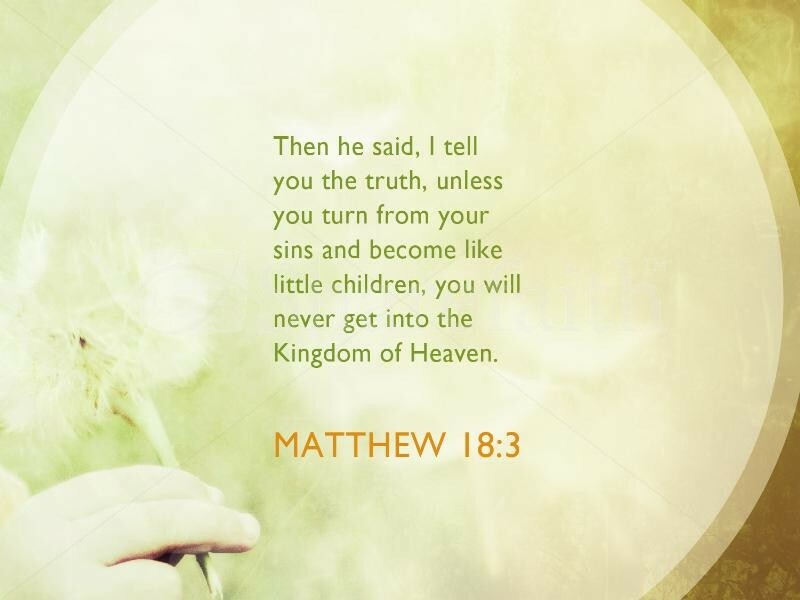 You can’t let someone believe in Jesus for you to inherit His kingdom. If your whole purpose for believing God is for your family, then what about you? Lets say your whole family is saved, that’s wonderful! But what about YOU? God cares about each and every one of us. And I know its not really good to compare… but if you had to choose, who would you run to? HALT! : The answer is God 😀 “As for me and my house, we’re gonna serve the Lord” (Joshua 24:15) not the other way around. 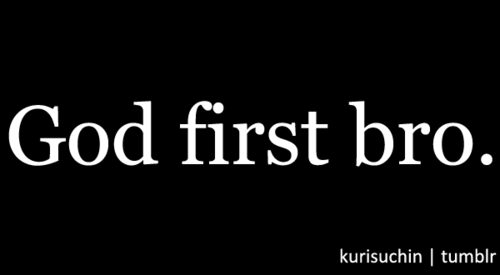 GOD IS YOUR FIRST PRIORITY. Suicide, Cutting, & Hurt || STOP! Had a nightmare last night of a friend who sought for attention, she had scars on her wrists due to cutting. “Don’t you notice?” she cried. So I just wanted to remind my peeps, you were bought with a price… maybe you’d say “Well I didn’t even ask to be bought” or “I’m too expensive, sorry”, my reply is, the Lord loves you and if He didn’t give His son Jesus to save you, well, you’d know where you’d be. Blunt truth guys. We don’t know how many kids and teens are considering suicide or other wrong decisions, but just so you know, somebody DOES care for you and LOVE you. Don’t destroy your body just because you feel emotionally broken. THE LORD IS NEAR THE BROKENHEARTED AND SAVES THE CRUSHED IN SPIRIT. (Psalm 34:18) Don’t even think about it. You think it will benefit others thinking that if you’re gone maybe they would live happier lives. WRONG! It’s a selfish thought to cut or hurt yourself. 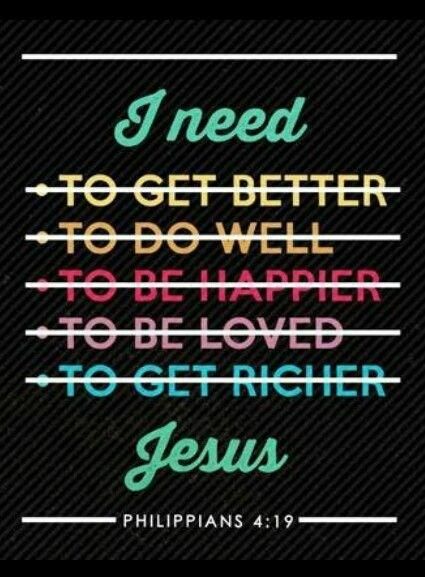 Don’t drown yourselves in thoughts like these, instead dive into God’s holy spirit and embrace His love. It’ll change you forever. A BIG, powerful, majestic, and holy God LOVES you and gave His only son to die for junk? I think not. He came to die for something worth dying for… am I right, or am I right? What’s the point of all this, if you’re not gonna let this change you? That’s all. ^_^ God bless! Childlike Faith || Do You Want to See Jesus? So do not lose hope and faith, trust in the Lord. Live for Him until you see Him face to face, live to love Him, live to glorify Him… God bless!